For those throughout Manhattan and surrounding areas in, New York, NY, Dr. Bradley Connor offers gastroenterological care and treatment from his state-of-the-art facility in Midtown East. Dr. Connor provides high-quality, specialized care in gastrointestinal infectious diseases including parasitic disease, chronic diarrhea in the returned traveler, persistent gastrointestinal symptoms post travel, Post Infectious Irritable Bowel Syndrome (PI-IBS), Small Intestinal Bacterial Overgrowth (SIBO,) Helicobacter pylori infections as well as colon cancer prevention by colonoscopy, treatment of gastroesophageal reflux disease, peptic ulcer disease, and Barrett’s esophagitis. Dr. Connor is a Clinical Professor of Medicine at The Weill Cornell Medical College and an Attending Physician at the New York Presbyterian Hospital-Cornell Campus. He has been in the private practice of gastroenterology and tropical medicine for the past 25 years. Dr. Connor has extensive experience in clinical research, having run clinical trials in Kathmandu, Nepal and Hanoi, Vietnam, and is widely published in the fields of gastroenterology and travel and tropical medicine. Dr. Connor is an Editor of the standard textbook in its field, Travel Medicine, now in its Third Edition. Past President of the International Society of Travel Medicine (ISTM), Dr. Connor has served as an Advisor to the White House Medical Unit, U.S. Olympic Swim Team, and Centers for Disease Control and Prevention (CDC). He was part of the World Health Organization (WHO) Task Force on travel medicine and malaria prevention. Dr. Connor is the founder and Medical Director of the New York Center for Travel and Tropical Medicine (www.travelhealth.net). Visit Our Newly Renovated, State-Of-The-Art Facility on the 16th Floor! Conveniently located at 110 East 55th Street, between Park and Lexington Avenues, and have recently moved to our newly renovated facility on the 16th floor! Our office is committed to providing high-quality and specialized care, perfect for those looking for a thorough and professional visit. We look forward to seeing you! Dr. Connor is the founder and Medical Director of the New York Center for Travel and Tropical Medicine. The New York Center for Travel and Tropical Medicine is a referral center providing pre-travel consultative services and immunizations as well as treatment for travel-related illnesses and post-travel medical screening. Dr. Bradley Connor on YouTube! Welcome to Dr. Bradley Connor's YouTube Channel. The video series "Discussions with Dr. Connor" touches on topics like Malaria, Travelers' diarrhea, Colon Cancer Screening, etc. New videos are posted bi-weekly for your information. 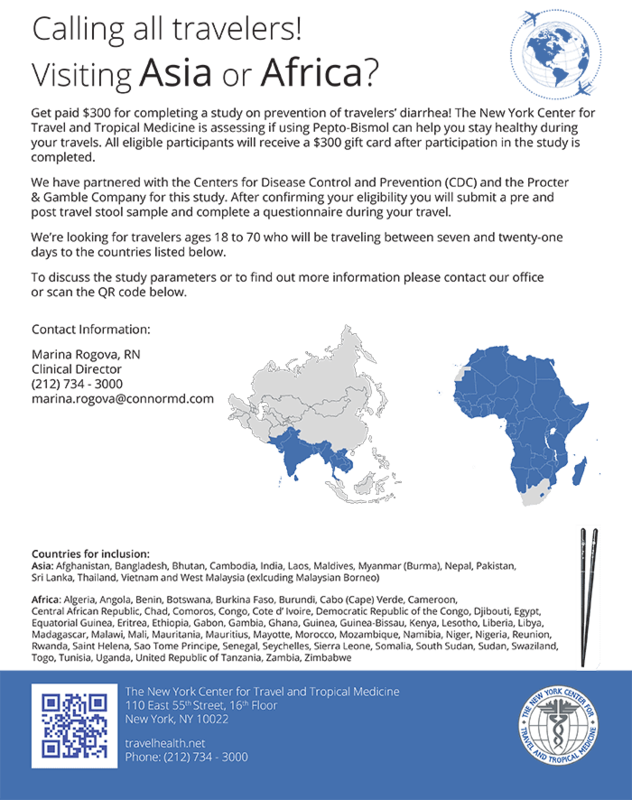 The yellow fever vaccine is available at our New York City office. We accept major insurance plans. For more information, please call the office. "I have been a patient of Dr. Connor for over ten years and his diagnostic skills are excellent and he is truly a compassionate doctor." "Dr. Connor is very thorough and doesn't leave any unknowns uncovered." "Dr. Bradley A. Connor is the most professional and caring doctor. The office staff is very professional."